Style and performance are what set the TLX Western Work Boots by Tony Lama apart from the rest. A premium leather foot and shaft help protect the feet from the top. 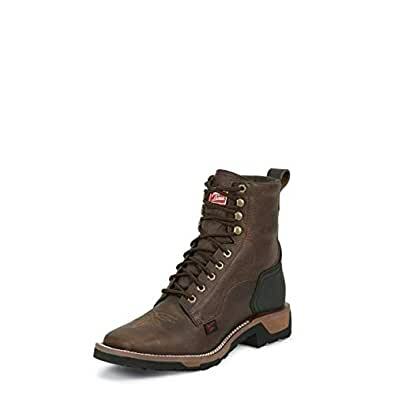 With durable rubber outsoles, scored PVC midsoles, and mesh covered open-cell foam insoles, these boots offer hours of comfort and support for all-day work or play. The extremely tough heavy-duty steel shank provides support where it counts the most. A unique TPU heel cavity insert disperses shock upon impact, keeping your joints safe. The high-performance rubber outsole is oil-, gas-, heat-, and abrasion-resistant and it offers traction control in many different terrains. High-tech, and high-energy, you might just wear out before these boots do! The Carthage 7-inch tall TLX Western Work Men’s lace-up work boot is a modern take on the traditional roper with a rich brown leather exterior that is crafted to withstand everyday wear and tear and features a square toe and double stitch welt. It’s built for comfort with the TLX Performance Comfort Package insole has multi-density foam to give you extra softness and shock absorption so you feel supported and the rubber outsole provides maximum traction on various surfaces.